Lots of cookbooks these days seem to start with a chapter on pantry staples. These are things that you want to always have on hand so you can – voilà! – cook up an amazing meal without a trip to the store. I agree with this theory and I have a pantry and I have a lot of pantry staples. I am not, however, turning out incredible meals with what I have on hand. Produce figures in strongly in most of my meals and if you buy a lot of produce you know, it doesn’t last long. That said, I think this was a great meal and it could easily become a go-to recipe for me. There are two only perishable things in this pasta. One is parsley which I always seem to have in my refrigerator and the other is feta cheese. Feta has an incredibly long refrigerator life span so next time you see it on sale, buy a few. Do yourself a favor and buy good feta – one that comes in a block and not in a tub. The pre-crumbled stuff tastes like sawdust to me. 1. Bring a large quantity of water to boil in a stockpot. 2. Meanwhile, heat the oil in a small saucepan over medium-low heat. Add the garlic and cook 30 seconds; do not let it get at all colored. Remove the pan from the heat and set aside. 3. Add the pasta to the boiling water and cook until very al dente, soft but not quite cooked through. It will continue to cook in the oven. Drain thoroughly in a colander and place back in the pot. Pour on the garlic oil and toss well. Let cool to room temperature, tossing occasionally to prevent sticking. 6. Bake, covered, for 25 minutes or until hot and bubbly. Remove the foil and bake another 5 minutes to lightly brown the top of the casserole. 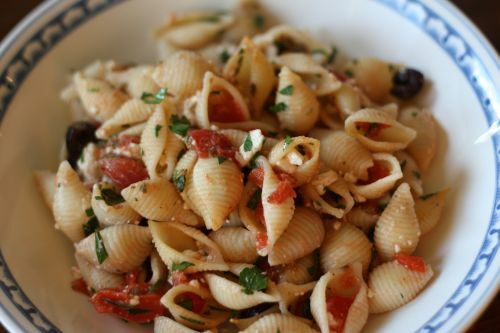 What a nice change from a regular pasta dish to Greek style pasta dish. I like the idea Dana! That’s look superb! Sometimes we need those ‘pantry’ recipes. Especially when you have to cook a quick meal during the week. Beautiful pasta dish. This pasta has my name on it Dana! This is a combination of my favorite ingredients. Olives, roasted red peppers, crushed red pepper, feta. 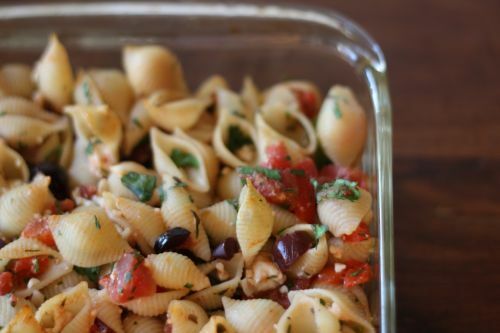 Looks great with the small shell pasta too! Ooo this looks yummy, easy and healthy! Amazing recipe. Thanks for sharing this tasty,healthy and easy to prepare snack. Keep up the ‘yummy’ work.